Everyone who has met me even once notices one thing right away. My hair is red. Not a natural auburn or Anne of Green Gables "carrots" red, but a vibrant, not found in nature kind of red. At work, more than one customer refers to me as "Red" as if I'm not wearing a tag with my name on it in full view. I don't mind this at all. In fact, and don't tell my customers this, I really like it. It's cute, and I find it endearing. I'll never admit that at the store, though, so don't try it. Most of us have colored our hair at some point in our lives, and I did it to excess. Born with glorious platinum blonde ringlets, they darkened into a dishwater blonde that I hated. Never one to go with the grain, I didn't go with the normal lightening of my sad locks, but instead tried every shade of red, purple, and finally jet black that I could find. Once I dyed it black (and hacked off all but an inch of it, but that's another story) I kept it that way for decades, only deciding last year that I would try bright red. The rest, as they say, was history, as I loved being a redhead, and even though the upkeep is a right pain in the tushie, I don't foresee changing it any time soon. But this story isn't about me and my penchant for dyeing the living crap out of my hair, although that is an important part. It's about individuality, and how the painfully shy girl of my youth who used to hide behind an ocean of sad, bland hair blossomed into an outspoken, confident woman who wasn't afraid of standing out in a crowd. I didn't dye my hair until college, but I see kids these days dyeing their hair crazy colors younger and younger. I even assisted in dyeing Small and Tiny's hair last year, a lovely ombre of pink and purple tips that they loved at the time. Personally I love the idea of kids having the option of dyeing their hair, and as long as it's allowed at their school, I hope that kids are able to do whatever they want with their hair, not because it's a thumb to the nose of authority (although that's pretty neat too) but because individuality is something that should be taught as much as that bloody Common Core math we all hate so much. Kids are in a constant state of exploring who they are, and what makes them an individual. Why not let them go purple or green or blue for a while? The great thing about the whole idea of dyeing your hair is that it isn't permanent, it will either fade or, in the event of catastrophe, can be cut off. 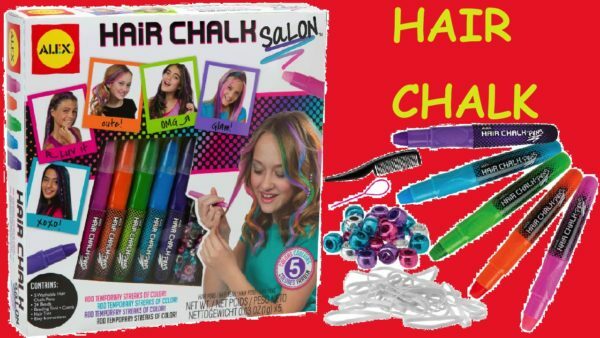 Kids finding out who they are and how they want to express themselves is something to be celebrated, not squelched, and if that includes a box of DIY hair dye, so be it. Imagine you're back in middle school (I know, it's a horrifying thought) and everyone looks so similar that you feel like you're fading into the background. For some shy kids, that might be something that makes them feel safe, and that should be honored, but for other kids, individuality can only be expressed in so many ways, and crazy hair colors are just the thing for them to say "Hey, I'm me, and I'm not afraid to say so." Of course it might not involve hair. It could be joining band instead of baseball, or baseball instead of band. It could be being perfectly happy reading a book at recess, or trying out for the musical instead of football. The beautiful thing about middle school in the midst of hormones and tantrums and sulking is the opportunity for growing kids to choose what makes them happy when they're not in class. But back to the hair. Some kids need to shout from the rooftops without saying a word. And although it may give you actual pain to see your baby with green hair, remember, it's not forever. One of the great things about kids is that they have the attention span of a gnat, and hair dye washes out. But while it lasts, it could be the thing that gives kids the confidence to stand out proudly. And that's just the greatest, isn't it?